A Democratic congressional primary in Dallas and its eastern suburbs has a collegial tone — for now. DALLAS — At one of the last Democratic forums in a hotly contested North Texas congressional primary, each candidate was asked the same simple — but difficult-to-answer — question: If you don't win, will you throw your full weight behind whoever does? All of them — former NFL player Colin Allred, former Hillary Clinton staffer Ed Meier, former Obama administration official Lillian Salerno, former TV journalist Brett Shipp and attorney George Rodriguez — sat on stage at Southern Methodist University and said yes. "It's been very collegial," Allred said. "I really think that we all feel like we want the best for this district. We all think we're the best candidates, each one of us candidates do, but we don't intend to tear each other down along the way ... We recognize the moment of history we're in." Turns out, this is the exception, not the rule. Nationally, Democrats are facing an existential threat to their ambitions to take the majority in the House next fall: They have too many candidates running in races they are desperate to win in November. The result has been infighting among candidates — and between candidates and the national House Democratic campaign arm, the Democratic Congressional Campaign Committee. But in Dallas, the primary candidates appear to like each other, at least outwardly. They've got their collective sights set on the seat's incumbent, Republican U.S. Rep. Pete Sessions. It was once unthinkable that any Democrat of real stature would run against Sessions: He's one of the most powerful members of the House GOP and this wealthy district was thought to be as Republican as they come. And then 2016 happened. Or rather, 2017. As the dust cleared from the last presidential election and political analysts studied the shocking swings for Donald Trump in the Rust Belt, they also noticed something interesting in Texas: Big cities like Dallas turned out in force for Hillary Clinton. And two Texas congressional seats — including Sessions' — flipped to vote for Clinton, while their incumbent Republican congressmen coasted to uncontested re-election. Early in 2017, Democrats announced they would target Sessions' seat. The district will be a difficult one for Democrats to claim. The richest people in Dallas live in it — including the same oil billionaires who fund the national GOP and its super PACs — and Sessions is a long-entrenched force in the city. He’s also a veteran committee chairman in Washington, D.C., and he ran and raised money for the House GOP campaign arm during one of its most successful years ever, 2010. Because of that, Sessions is not just any rank-and-file Texas House Republican. He has posted strong fundraising numbers each quarter, and his political instincts are sharp. And Democrats who tried to defeat him during his last big race in 2004 warily recall a candidate who was self-aware about his shortcomings and effectively mitigated them. But the candidates on stage at SMU and at local Democratic club meetings in the district are determined to defeat him. Two of the most exclusive neighborhoods in Texas — University Park and Highland Park — are in the district. Practically every other yard has a sign boasting “Mad About Plaid,” a nod to the local high school’s mascot, the Highland Park Scots. Less frequently, but more than one might expect, there are yard signs for the Senate campaign of U.S. Rep. Beto O'Rourke, an El Paso Democrat who is challenging U.S. Sen. Ted Cruz. That there are any O’Rourke signs at all here is significant — indicative, even, of better-than-usual chances for a Democratic U.S. House candidate to latch onto O’Rourke’s coattails and the larger backlash against President Donald Trump. 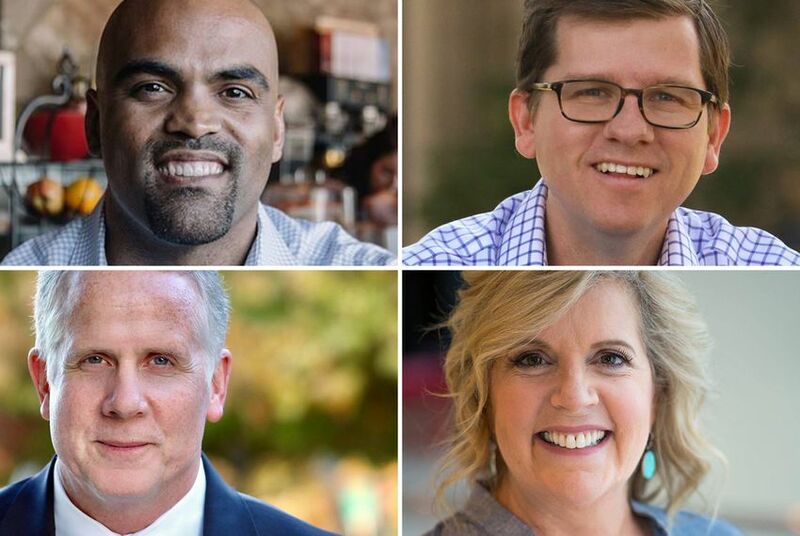 Two other local Democrats, Ronald William Marshall and Todd Maternowski, are running for the seat, but there are four Democrats have put themselves into a top tier of candidates with their fundraising and other unique strengths. Meier is the top fundraiser in the race and has deployed those resources on the television airwaves. The former Clinton staffer, who worked for Hillary Clinton at the State Department and on her 2016 presidential campaign, has used those connections to raise more than $900,000. He said every campaign needs a strong grassroots base and "a unifying message" — as well as the money to get that message out to "fight back against that special interest and super PAC money that's going to be pouring into my race and races like this around the country." Salerno takes her case to voters with personal stories on women's issues, which have become hot political topics following Donald Trump's election and the #metoo movement. "This is about power. This is about representation," she said at that SMU forum. "Until we get more women in the room, it's not going to change. We need to elect more women." EMILY’s List, a Democratic fundraising group that bolsters female Democratic candidates who support abortion rights group, backs her but has yet to make substantial investments in the race. On Monday, she had a private meeting with U.S. Sen. Kirsten Gillibrand, the New York Democrat who is frequently mentioned as a 2020 presidential contender. At a luncheon for Dallas women, Gillibrand offered her endorsement and presented Salerno with a $5,000 check. Salerno is not the only one with help from well-known political allies. Former state Sen. Wendy Davis stumped for Allred in Garland on Sunday, vouching for the work he did on her gubernatorial campaign for voting rights protections. He also has the endorsement of former Housing and Urban Development Secretary Julian Castro of San Antonio. "You've seen the early voting numbers, they're through the roof," Allred said. "And I think we can take a lot of credit for that. We've knocked on 20,000 doors since December." And then there's the wildest card of all: former television journalist Brett Shipp. He has the least campaign infrastructure, but he may not need it in the short term. He grew up in the area, and he and his father were both local television news stars. "I loved my job, but then Donald Trump got elected," he told a group of North Dallas Democrats last week. "And I thought, 'Well, this man can't last any longer than six months.' And he did. I thought, 'This is not good.'" Shipp said his decision to run for Congress was sealed after the mass shootings in Las Vegas and in Sutherland Springs. Each candidate presents a plausible case for why he or she will make a widely expected runoff, but with little public polling, it's anyone's guess which two candidates will emerge — and whether the collegial tone will continue when it's a one-on-one contest.